“猪脚醋”- "Tu Kar Chor" in Hokkien or "Chu Kiok Chou" in Cantonese are one famous dish in chinese community. Most of us who taste it before would straightly fall in love with it. Who can resist the sweet, sour and spicy taste of this yummy trotters, right?? I don't take fat meat and skin, but when eating this “猪脚醋” it's totally opposite, I just love the fat meat and skin... slurppss!! It's one of the famous dishes for confinement as well. 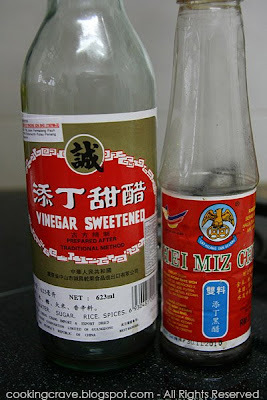 Chinese believe black vinegar purifies the blood, old ginger drives out wind and brown sugar puts a check on "dampness". Pigs' trotters are said to provide collagen and is good for strengthening joints & lumbar. Sesame seed oil is also to promote blood circulation and the eggs to nourish the body. But for most of us, we just LOVE to eat this dish☻- whether confinement or not! This is also a dish popularly offered to relatives & neighbours who come visit. "my mom's favourite piece of “猪脚醋” ... she loves the fat pork fingers, hahaha.."
Clean & pluck off the hair from the pig's trotters. Cut into big serving pieces. In a wok, heat the sesame oil. Fry the ginger until it's golden brown and fragrant. 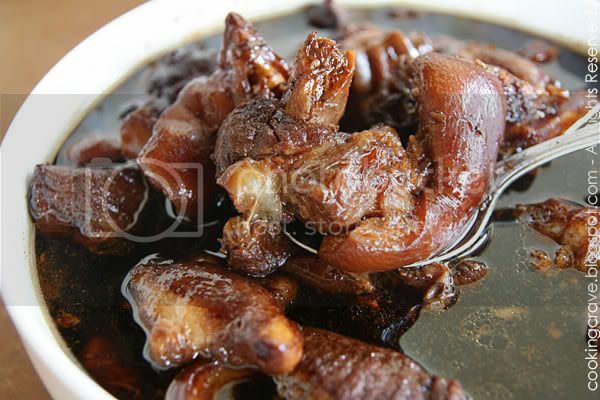 Stir-fried the pig's trotters pieces with the remaining oil until it's slightly cook. While frying you'll notice water drain out from the meat. Put the fried ginger into a big pot. Add the sweet and sour vinegar and water in it. Bring it to boil and let it simmer in low heat for 1/2hrs until the ginger are soft. 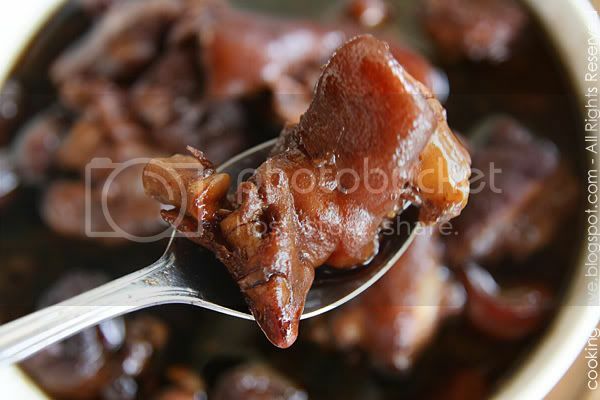 When the pig's trotters are ready, add the brown sugar (I use palm sugar) to taste and cook till the sugar dissolved. Add the hard boiled eggs 1/2 hr before serving. Serve warm with white rice. This dish also tastes nicer after few days. If you can spare your crockpot/slowcooker, you can also prepare this yummy dish in your crockpot. Try to add less water as possible for yummier taste of this dish. Do not soak the hard boil eggs too long in the vinegar soup as it will harden the eggs. We can also cook this dishes using pressure cooker and it's not that time consuming. I just left it to cook for 20mins after boiling, both the pig's trotters and ginger are soft!! Not easy thing to cook but I really like this dish! 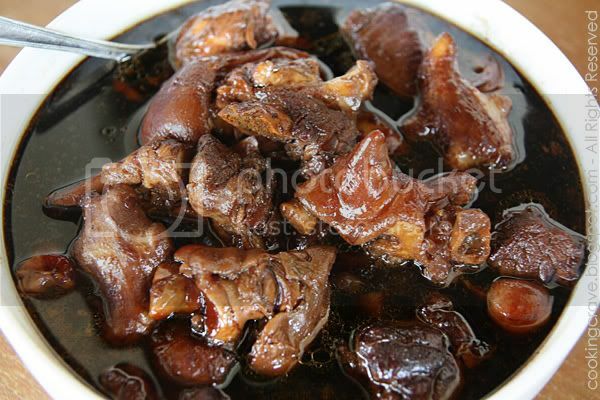 Oh this is just my type of dish...slow stewed pig trotters in a sweet and sour sauce! I must find those vinegars here! yesterday too busy didn't have time to buy the trotters.. now regret after seeing it on your blog cos i think cannot sleep liao.. i want to eat these yummy dish! i used to cook this a lot, but concern about my mom's blood pressure! LOL!! Colin : Ask your wife to cook this for u. It's easy to cook,u just need to get the right black rice vinegar for this dish. Giggle : Ya, this dish are high colesterol and sweet..not suitable for those who are high pressure and diabetic.